For 35 years, our customers have raved about our signature English Butter Toffee! The crunchy toffee center is made with plenty of pure, dairy-fresh butter. 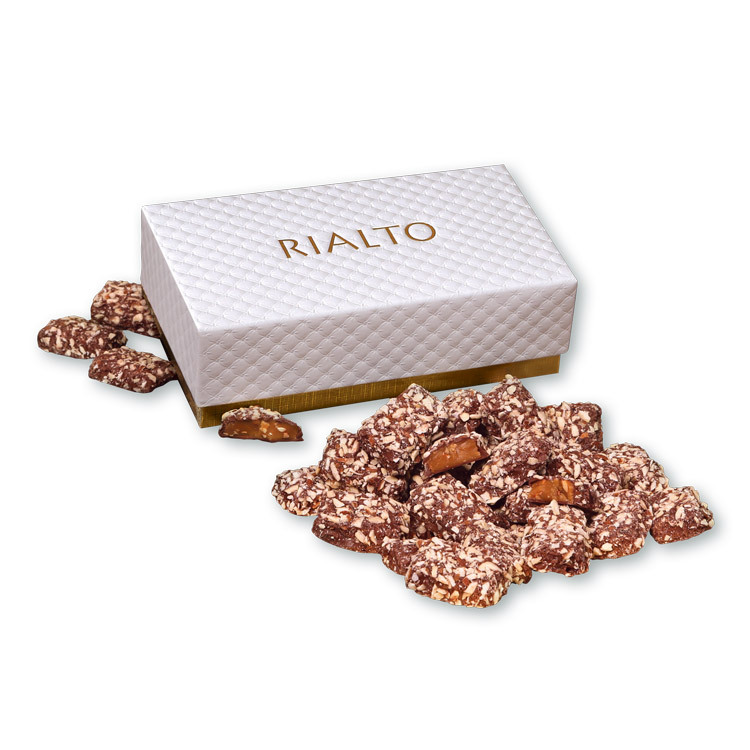 Then we enrobe each piece in rich, premium chocolate. Finally, we cover it with toasted almonds. With nearly 36 pieces in this one-pound box, there's plenty to share with friends and family... but don't be surprised if they want to keep it all for themselves. The elegant gift box, with your logo foil-stamped in gold, makes an awesome presentation. * Because of the special pricing on this gift, no other discount offers may be applied. * This item is available in limited quantities and on a first-come, first-served basis. Gift Box: 7.375" × 3.875" × 2.25"
• Price includes imprint foil-stamped in gold on gift box. • Maximum Size for Customer Supplied Enclosure Cards: 6" x 3.5"